Zeta Minor - The Expendables - Stallone, Lundgren, Statham, et al! Return to your action roots this summer as legend of cinema Sylvester Stallone (Rocky, Rambo) takes you on an explosive adventure of a lifetime. On August 19th this is your chance to experience the much celebrated action movie institution in its most glorious form. Modern day action heroes Jason Statham (Crank 2, Death Race, The Transporter Trilogy) and Jet Li (The Forbidden Kingdom, Unleashed) join forces with Rocky Nemesis Dolph Lundgren (Rocky IV, Universal Soldier, Masters of the Universe) and Bafta Winner Mickey Rourke (The Wrestler, Iron Man 2) alongside timeless heroes Bruce Willis (Die Hard) and Arnold Schwarzenegger to make the cinema a dangerous place to be this August. Rounding out the cast is wrestling superstar ‘Stone Cold’ Steve Austin, Eric Roberts (The Specialist, The Dark Knight), Terry Crews, Randy Couture, David Zyas and Giselle Itie. When the mysterious Church offers Barney a job no one else would take, Barney and his team embark on what appears to be a routine mission: overthrow General Gaza (David Zayas), the murderous dictator of the small island country of Vilena and end the years of death and destruction inflicted on its people. On a reconnaissance mission to Vilena, Barney and Christmas meet their contact Sandra (Giselle Itie), a local freedom-fighter with a dark secret. They also come to learn who their true enemy is: rogue ex-CIA operative James Monroe (Roberts) and his henchman Paine (Austin). When things go terribly wrong, Barney and Christmas are forced to leave Sandra behind, essentially giving her a death sentence. Haunted by this failure, Barney convinces the team to return to Vilena to rescue the hostage and finish the job he started. Perhaps, also, to save a soul: his own. 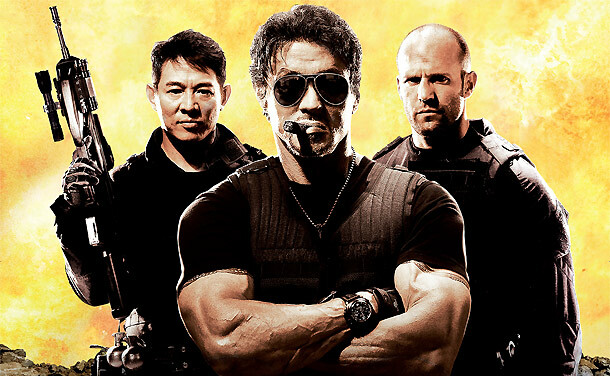 The Expendables - the action film to end all action films! Q: At the screening last week there was a massive round of applause before the film even started, and as each star name appeared there were whoops of joy. To what extent does that level of excitement and expectation bring extra challenges or responsibilities to do something really special with The Expendables? Sly Stallone: It’s a lot of pressure because sometimes you come to a film and you know you’ve got a major turkey and it’s not even Thanksgiving. It’s bad. This time this is the other end of it, where there’s a great expectancy and you think, geez, I didn’t expect this when we started making this. You begin to say is this going to live up to its idea? It’s kind of complex. You are damned if you do and damned if you don’t. Dolph Lundgren: I’m afraid of saying anything here [chuckles]. It’s like fighting in the world championships, instead of the regional championships in sports, I guess. This movie is like the world class, the best of all times, and you just feel you want to live up to it. Q: [To Stallone and Lundgren] How would you compare your screen relationship now, compared to 25 years ago in Rocky IV. Is there the same dynamic there? Q: Dolph, do you like to comment any further? Q: With all the testosterone with the male cast, did you have an all-female crew to balance it out? 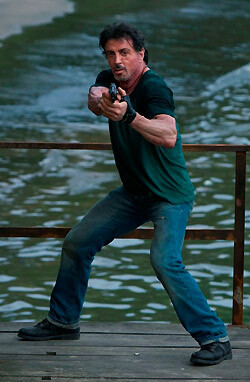 Sly Stallone: You don’t – you just like, fake it. You guys are very aggressive, every one of them. The worst thing you want to do… Let’s say Jason does an action beat and he’s very physical – you’ll see in the documentary, he does his hands [in] and [they] were in ice and he’s leaping onto baked ground, over and over. He keeps wanting to do it, and I say, stop, stop, stop. Then the next fella who has to do his stunt goes, Jason was rather good. I’m going to kill this guy… So, it keeps building in competitiveness – that’s why you have such a physical, testosterone movie because men are just naturally competitive and they want to keep upping the ante. I don’t know if there were any women around – if they were they were tougher than the guys. You had to be tougher in this show. Q: Were there any stunts you won’t do, anything you’re scared off? Jason Statham: I won’t wear a flowery shirt… It’s all part of the cause. I mean the way movies get made when Sly’s in control. He shoots a lot of the stunts in the camera. A lot of the action directors of today tend to rely on the movie as a visual and it becomes very boring because it’s a lot of CG and people don’t really care too much about it. When you are doing an action movie that requires real men doing real action, it’s an opportunity to do that [Sly’s way] – that’s all we’re looking for. We can’t wait to get stuck in and do that kind of stuff. Q: [Stallone asks Lundgren] What are you afraid of? Dolph Lundgren: Saying too much at the press conference? Q: You’ve got the best action line in history – is there anyone you wanted to be involved that couldn’t do it, or didn’t want to do it? How did you get so many names involved? 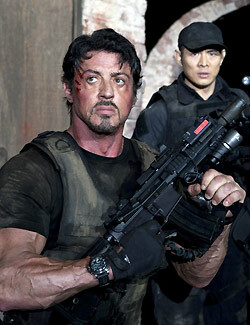 Sly Stallone: At first it was just myself, Jason and Jet Li and then it began to build on that. As I started getting rid of other characters – one time I had Ben Kingsley as a bad guy and Forest Whittaker, I said this is not going to fly. Let me just try and go real old school. So, I called Dolph and of course he accepted immediately. He was very, very gracious and told him Jason was on… No disrespect, there aren’t a lot of ‘bad asses’ out there, guys who just want to get it on. Now, I believe the younger generation of these guys come up would love to do this, like to show their metal, I really do. I’m not saying they’re reluctant to do it, just there’s not an opportunity. All young men want to prove themselves. It’s just part of it. When you get older you still want to keep proving yourself. It’s just in the blood. There is none around. That’s why I went to MMA [Mixed Martial Arts] that’s growing and got us the five-times world champion who is literally ferocious [and] at the top of his game, Steve Austin who is an incredibly powerful human being. Whatever you feel about wrestling, there are still tough guys, big, 250-pound solid muscle, and we just kept building from there. Then I called Jean-Claude Van Damme and Steven Segal who had different ideas on their career – I did the best I could. Sly Stallone: What do you think, Jason? [Laughs] Yes, stars don’t matter that much. They really don’t. Concept matters, the overall originality, or reinterpretation of really classic situations, like Star Wars would go back to… What is the really famous philosopher who did The Hero with a Thousand Faces? Dr Joseph Kemp [means Dr Joseph Campbell]. There are all variations on that. When we started out – before your time, Jason… you were a thought. You were a concept [laughs], Dolph and I, they’d put you in a film and they would surround you with kind of like just guys, then they would develop a character, but you can’t do that today. That’s where I realised that like Rambo was a one-man show and even the last Rambo I started doing that more, but those days are numbered. How have the films changed the business? It’s pretty much reflective of that… There is a lot at stake today, where you went from 400 films a year, now down to 250, maybe 150? Then when you get down to studios, maybe even less? The stakes are very, very high… a science on what they make. So, there is no more, oh I’ve got a gut feeling. I’m going to take a chance – I know everyone says no, but I’m going to try new. That’s gone. So, it’s all scientific. Every actor is weighed against what he’s going to bring in for the territory. It’s like a math project, it really is. Q: Sly, how does your faith inform the career choices you make, and do you feel the need to justify the violence in your films? Sly Stallone: Well, I’ve made a lot of career mistakes. A lot. Actually, a lot of personal ones, too. I never started out to be an action actor. I was an ensemble actor. Rocky was an ensemble. F.I.S.T was ensemble. Paradise Alley was ensemble. Then along came First Blood and there was a beginning of something unusual, once all the dialogue was cut out of it, it was a completely visual film. I believe that the violence is very justifiable. The one thing in my films [is] I only kill people who need to be killed. Killers killing killers – matter of fact that was one of the scenes we cut out of the movie [The Expendables] was what happened to the code? We only went after bad people. I said the code died of apathy, showing that I couldn’t care anymore. Let me just put it this way: the ones that deserve to get it, they get it good, and the ones that go after women, really get it. They say, oh, isn’t that overkill? I’m not going to have a man sitting there and really having his way with a woman and tearing her apart and just wrecking her life and just shoot him with a bullet. That’s too civilized. He’s going to feel real pain. And I think the audience has that cathartic feeling. Now, if you did that in every scene then it’s a horror film. I don’t feel guilty about it at all – but if you want me to, I will! Q: Jason, what was it like acting with the heroes you grew up watching? Jason Statham: Well, he’s [Stallone] is a bit of a bully, actually. He carries a big stick around and starts, you know, ordering tea and coffee… It’s not as comfortable as you [think]… It’s a situation that you get to know the real man behind the camera. It’s not the film-maker anymore, it’s a regular guy. I think, to me that was the best part about working with Sly was getting to know him as a person. There is no substitute for that… We’ve seen all of his movies for the years. We are very familiar with everything he’s done that’s why we get excited when we get to do films like this, you know? Sly Stallone: It’s nice knowing I could be his father [Statham’s]. That’s really comforting. Thank you very much! Sly Stallone: No! Well us? Yeah, definitely! Are you kidding? We were like headwaiters at the Last Supper. Yes, we had a dinosaur as a house pet. We’re old… Well, I am. As for the women as being victims, it’s like a throwback to the 80s. I wanted to use that kind of set-up, whereas a woman had this passion, she was a patriot, she was like earlier Sophia Loren. As a matter of fact, I would have the girl [Giselle Itié who played Sandra] look at Sophia Loren movies and say you’re that kind of fiery person because I don’t want to go into something that is a little too complex, a little too controversial, a little too politically correct. I said, let me just go back to old school. But in the end, that girl was water board, for real. Talk about tough. She did her own stunts. She was very favourite - am I right [to Lundgren and Statham], with all the guys? Believe me, that woman is real tough. Q: Sly, how did you juggle acting and directing the film? Dolph, Jason, what was it like acting with Sly, whilst he was also directing? Sly Stallone: There’s a line in there. Did you all see the film? Anyone want their money back? [Laughs] Then I’ll go on. The scene, for example, where we have all the Somalian pirates and it’s building up, guns and feds… bullets and blades… Are you ready? You want the money, come and get it… and you go ‘eeeeee’ [mimics sound of incoming text]. What’s that? I’m getting a text. Excuse me? Now, when I said I was just going to shoot the pirates, ready, come and get it, shoot, Jason’s saying, I’m getting a text. He goes, what? I say, say I’m getting a text. He says I’m not saying that. I said, say it. Now the camera’s rolling [still]… I’ll go like this ‘eeeeee’ and you say ‘I’m getting a text’. He said you’re going to go ‘eeeeee’? I said yeah, I’m going to go ‘eeeeee’. Now the camera’s still going… ‘Eeeeee’ – am I doing it right [to Statham]? I say, what’s that? I’m getting a texting. Then I say to Terry [Crews], it better not be from my wife! He goes, what? I say, just say it! When we did a documentary you’ll see how… you have the formula. You have the blueprint. Then once you have it, let’s just go, and everyone starts to just ad-lib and sometimes that’s where it came from, that was not scripted. We had a nice thing. We had a well-scripted piece but it didn’t have that eccentricity – same with Dolph and hanging a pirate. I said, what are you doing… he goes, hanging a pirate. I said why? Vikings hang pirates. I said excuse me? Old tradition. It’s crazy what is memorable! Dolph Lundgren: Well, they’re right, both of them. I agree with them. He [Stallone] rewrites stuff when you are lying there in your death scene, and he’s like, say this, and you are like what? Just say it! But it’s fun. It’s different, but it’s cool. It works. Sly Stallone: His death was like shot three different ways. One is he wanted a Viking funeral. I’m going you’re not. So what? I go, fine, fine. You mean you’d let the guys push you out on a boat and [be] burned. He says, yes I want [mimics Lundgren’s accent]. Schmuck. Ok, fine, you want something miserable like. So, it became this Viking funeral thing and this kept going and going and going, which I used in the Director’s Rational Cut. Q: Jason, this is the third time luck with Jet Li. How has instrumental has that been in shaping your career as an action star? Jason Statham: It’s difficult because my first movie I did with Jet wasn’t what it was supposed to be but it gave me the opportunity to work with Corey Yuen, which was instrumental in me playing the Transporter films. So, there was a great relationship that we had there. It was coincidental that we were doing this film together. It’s that we tried to beat Sly up and hold him down and say, we want to do another film together – make sure we’re in it! It’s one of those things. Sly Stallone: I think it’s also a perfect example of how difficult it is to really get an action film out [there] and have it perform and get the proper people in it. It’s just hard. So, finally, it’s great for Jason to get a chance to see like how it was done the old way, which is kind of a simplification of a very complicated process. Jason Statham: In fact I’ll add to that because the films that I have done with Jet Li have been very science-fiction-based, and this is why this one works, especially for me, because it harks back to old school action movies that basically are the ones that I’m interested in doing. Q: The paternal theme harks back to Rocky Balboa. In The Expendables there is almost a paternal angle to your relationship with Jason’s character, Lee Christmas. Is that intentional? Sly Stallone: It’s very intentional. You have to be age-appropriate and he would be like the protégé. He is like that fella who I confide in and will eventually take over. I tease him about his love life and taking things too seriously – something like a father and son would do. But it’s not by accident… I try to always deal with redemption. I think everyone in this room, everyone on the planet has a regret that that one moment they made the wrong decision, which sometimes just never gets your life back on course. That theme from Rocky Balboa to Rambo, it just haunts me - maybe I’m just mono-minded or limited, but it’s inextinguishable. So, this thing with Mickey Rourke, we used to be something. Now with nothing we’re crap because we gave up this. Ah, redemption, how do I get this back, by doing something quotes ‘charitable’, like she said at the beginning, giving something for nothing is really a gift… So, that’s the theme. With Jason, that whole thing with the girl, full circle, just little bits here and there, without overburdening the film and turning it into a kind of talkfest – which you couldn’t understand what I say anyway, so, why bother? Q: Sly, it’s the elephant in the room, age and the action star. In the last two films, Rocky and Rambo there was a sense of closure that you’re saying ‘goodbye’ to your characters. There wasn’t that feeling with The Expendables. Are we going to see more action films from you and Dolph, or is enough, enough and time to move onto movies that are a bit more mind than muscle? 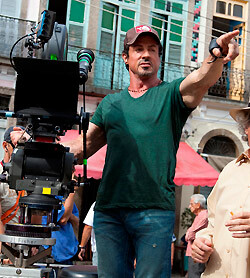 Sly Stallone: You’re too tall to work with – that’s why I brought in, ‘he doesn’t work with tall people’. Everyone in the movie’s tall. Excuse me. So, yeah, I would like it to go on. Q: Dolph, you’re similarly in that position now. You’re still doing action films, but you’ve directed five of them. Are you in a position now of thinking, perhaps, to give up front of camera and stick to behind the camera? Dolph Lundgren: [Laughs] That’s why I quit! Q: Why to do think people fell out of love with the action hero, and do you think this film will bring the idea of the action hero back? Dolph Lundgren: Well, I don’t think they fell out of love. It just changed a little bit, but it will change again. Was that short enough? Sly Stallone: He’s absolutely right. Every generation, including mine – I didn’t identify with John Wayne. Way too early. I was with James Dean. You have to find your own heroes, and this generation has to find superheroes as their heroes. That’s why we’re kind of a novelty. That’s the way it is. Films change. Look at music – it’s unrecognisable from 20 years ago, but that’s just the way it is. And then maybe it will go retro. Only Jason’s current, which is really lucky for us. Q: Such a stellar cast, if you could have paid this lot in the 80s, it would have cost you everything you’ve ever owned. How did you go about paying for it now? Did you call some favours in? Was it mate’s rates? Sly Stallone: A lot of it was crime. I mean I could never afford Bruce and Arnold – it would be like the whole budget of the movie. You know, Jason is a lot of money, but he’s well worth it. I mean, seriously, £100 a week, unbelievable, plus free fax paper - what do you want? You’re absolutely right. It would have been totally impossible. I’d say one of the reasons they didn’t do was because everybody back then wanted their price. Things have changed, I mean, prices are dropping drastically. You’re lucky to get work. So, looking at people who were getting 10 million [dollars], now they’re down to like 2 [million dollars] – and they’re going like, thank you. But his was all favours. This was done really low budget. Some of these guys literally almost worked for nothing – meaning me. It’s just the way it is. Maybe it’s come to fruition that this never could have be done back then, that’s all. I certainly couldn’t have got Arnold and Bruce back then – not a chance. Never. Just too expensive and too busy.